All-new thinner version has a lowered profile that can accomodate any shoe! The Flat Foot Insole was designed to reduce over-pronation and help relieve foot, knee, hip & lower back pain associated with having flat feet or low arches, but they will not fix the abnormalities of having flat feet as they are not a corrective device. We do not recommend that you use the Flat Foot Insole with a normal arch as it may cause problems rather than alleviate them. Flat Foot Insoles do not work with other insoles or orthotics. Remove existing insoles or orthotics before inserting the Flat Foot Insoles. Shoes that have a built-in (non-removable) arch support or highly raised arch area may cause discomfort. If you wear orthotics, consult your Doctor before wearing Flat Foot Insoles. 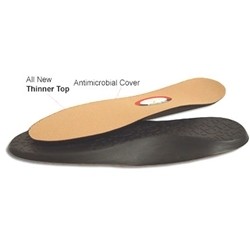 If you experience acute discomfort or pain from wearing Flat Foot Insoles, discontinue use. Allow for a few days of light to moderate activity using the Flat Foot Insoles before engaging in strenuous workouts or long distance runs. The first few times you wear the insoles, you may feel slight pressure in the arch area and/or some tightness in the calf muscles. Selecting the correct sized Flat Foot Insole is important. Please read all of the information below. MEN - If your shoe size is a half size, start by selecting the next larger size. Example: If your shoe size is a 9.5, choose a 10. If that doesn't work, try the next smaller size. size. Example: If your shoe size is a 7, choose a 7.5. If that does not work, try the next smaller size. Special Note: Each insole has the Men's and Women's Sizing imprinted on the bottom. DIABETICS: If you are a diabetic with flat feet, do not wear this insole.